(3) know how to learn & improve effectively. Even if just for a minute or two, even if you just throw to yourself in your bedroom – get some hand-on-disc time every day, and make a mental note if you miss a day. You can throw casually or intensely, work on something new or practice something learnt, throw with randoms or with team mates, so long as you make throwing around a habit, you will have taken the first big step to becoming a much improved thrower & catcher. Find out what motivates you and run with it – perhaps meeting up with someone in particular to throw, perhaps getting some sun towards the end of the day – whatever will be sustainable motivation for you. Once you’re out and throwing around regularly, the second step is to give yourself purpose – are you trying to throw & catch with perfect technique, or are you pushing your limits / experimenting with variety? Are you still weaker catching with your non-dominant hand? Can you clap catch equally well with either hand on top of the disc? “Perfect practice makes perfect”, so your ‘ideal’ technique must be as balanced and efficient as possible. Variety can help shore up your technique and make you better at adapting to non-standard situations – as defenders always create these – but you should always be aware of what the ideal technique is in a standard situation, and aim to be able to replicate it flawlessly, both for catching and throwing. Practicing faking before throwing is important too – faking different throws to different places before executing a variety of throws will get your body familiar with making game-like movements. The power stance is where you stand with feet slightly wider than shoulder width apart, knees slightly bent, disc held flat at your waist, with hands at 11 and 1’o’clock, and all fingers on both hands tucked under the rim. This means you are already coiled to throw quick lefty or righty backhands, and ready to pivot / set up your body for regular backhands / flicks / hammers / off-hand backhands in a balanced manner. By training to throw every throw from the power stance, and conditioning yourself to get into the power stance whenever you catch the disc in a game, you are normalising game situations (bringing them as close to throw-around situations) as much as possible whilst also maximising your options on the field. After releasing the disc, hold your final stance for three seconds, to emphasise balance. If you are releasing the disc from a balanced position then your consistency and ability to adapt or turn the throw into a fake goes way up. Make sure you can perform every type of throw finishing in a balanced position. Once you’ve got the hang of this, practice doing the opposite – practice pushing off and running as soon & as fast as you can after each release. Footwork: for both backhand and flick – step perpendicular to your target, point both feet towards the direction of your step (or slightly towards the side of your throwing hand), and bend your knees to get your hips / centre of mass close to the floor. Stay balanced. Grip: for backhand, all fingertips should be under the rim, resting in the crease between the rim and the underside of the disc. When changing to flick, it is most efficient if the tips of the index and middle fingers do not move – so when the disc is cocked back, the tips of the index and middle finger are still resting in the crease, the thumb stays clamped down on the top of the disc, and the ring and pinky shift to clamp the outside of the rim for stability. Changing grip from backhand to sidearm & back must be practiced, and can be practiced virtually anywhere*, until it feels smooth and controlled. The forward movement of a flick should begin as soon as the grip has changed – do not hesitate with the disc in a flick grip – this means the ring and pinky finger sometimes do not get involved. * there are many productive things you can do with a frisbee whilst waiting for food to cook or watching an episode of something: smooth grip changing, clap catching both ways, clap catch transitioning into backhand grip, flick muscle training, and generally becoming familiar with the size, shape, weight, and rigidity of the disc helps with catching. Release: the meat of a throw comes from the core, with a fairly relaxed arm/wrist only adding fine adjustments – make sure you are rotating your core/shoulders for both flick and backhand. When fully wound up, the disc should be at the same angle and on the same plane you want the release to be, and as you bring it forward, the disc should move in a straight line towards the target & not change angle – this transfers your energy into the velocity in the most efficient manner, and reduces the negative effect of an accidental early or late release. You should wind up as you are stepping, and release just after your foot hits the floor – “step-throw” not “step, throw” or “stepthrow”. Spin: once you’ve been through the above stages, one remains: Spin. Keep adding more and more spin to your throw. You can’t put too much spin on an accurate throw. “Touch” video. Technique for a fake should be identical to technique for a throw, as the realism is directly related to how effective the fake is on the field. The “perfect” area to aim for on your receiver is the neck – this is the mid-way point between the ground and the extent of their reach when they jump, so this is the point which has the highest margin for error, therefore the safest throw. From your power stance to the furthest back point of your wind-up, the disc should be taking the most direct path, without changing orientation or hesitating at any point. If you rotate the disc on any axis not perpendicular to the ground during your wind-up, hesitate with your flick cocked back, move the disc up and down, hold your backhand far away from your body whilst winding up, or do anything else unnecessary with the disc or your body, you have “baggage” on your throw and you should be working to get rid of it to maximise the efficiency of your throwing technique. The clap catch is the safest way to catch, and Ultimate is a possession game. 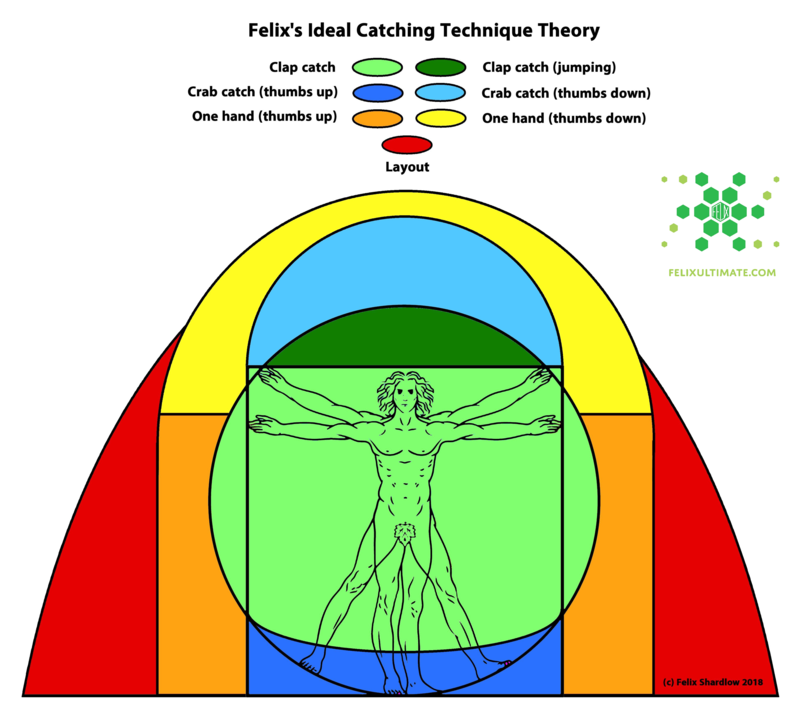 Different situations require different types of clap catch – you should always provide a ‘backboard’ for the disc, stopping its velocity with your body or your wrist even if it were to continue past your hands – this affects which hand you should place on top. For example, a flat disc which is going to pass at head height a meter to your right should be caught with right hand on top, so your right wrist acts as a backboard. If the disc is passing on your right at thigh height, left hand on top will mean your right wrist acts as a backboard again. Grip transition times are negligible compared to the importance of making sure of the catch. Another variable which affects the way to clap catch is the angle of the disc. Position your body so the disc will be coming straight towards you (rather than slicing across), and if the disc is tilting to the left, catch left hand on top – if tilting right, catch right hand on top. This avoids you having to twist your arms and wrists awkwardly. Aim for perfection – have both hands contacting the disc at the exact same time, in the centre of the disc, without changing the angle the disc was flying at. Crab catching is the quickest way to catch, so is critical in any pressure situations. If the disc is still above face height when you are at the top of your jump, crab catch with thumbs under the disc. If it is still below hip height when you crouch, crab catch with thumbs on top of the disc. To make your crab catches safer and easier, align your shoulders with the angle of the disc. For example if a slightly bladey righty hammer comes in high (tilting to the left), you want to rotate at your core so your left shoulder is lower than your right, thus both arms can be at full symmetrical extension with no extra wrist/shoulder rotation needed when you catch. Where possible, get your eyes on the same plane & tilt as the disc too. This is far and away the best & fastest way to improve your throwing and catching on your own accord. If you tend to do something one way, or if a throw goes wrong in a particular way, overcompensate and make sure you do it to the opposite extreme – do it wrong the other way – and you will quickly find the middle ground. If it goes wrong three times in the same way, get it wrong three times in the opposite way before continuing – try to even out your errors to 50% either way. The rule of overcompensation applies to pretty much everything, from specific details (if your throws often go outside-in, try extreme inside-out angled throws), to wide-ranging statements (if you don’t clap catch enough, try to clap catch too much – where a crab catch would be appropriate). A list of throwing/catching modifications to experiment with, and ways in which to overcompensate, can be found at the end of this article. As soon as the disc is thrown, read it and make a detailed plan for the catch. Decide (a) exactly how you are going to catch it – what angle it will be at, what type of catch you are going to execute, where on the disc your contact will be, and even what parts of your hands are going to touch it first, (b) exactly where you are going to catch it – are you going as high/early as possible, as safe as possible (chest behind clap catch), as early / late as possible, or something else – this changes how you approach it. Plan out each step you are going to take before the catch and begin to execute that plan immediately. In the second after the disc is thrown, you will get a better read, and will have to make modifications to your plan – make these changes as early as possible, so that they can be as slight as possible, and the overall plan becomes clearer as it doesn’t have to change very much. These modifications continue right up until the catch, and get smaller and smaller. A benefit of knowing what the ‘ideal’ technique is that you won’t need to abandon your plan if it goes slightly wrong – you’ll just need to make a modification (unless something unexpected happens). By the time your hands contact the disc, you will have subconsciously prepared so well that the catch will look easy. For distance, you either need more inside-out angle on your technique, or you need more power on your throw. If your ‘long’ throws are turning outside-in, change your technique to release the disc more inside-out, focusing on spin, aiming to get the disc landing at an inside-out angle. When your long throws begin landing inside-out, you can then focus on adding power to the throw – until they are turning outside-in again. Add power by dropping your shoulder, rotating your core, and ‘snapping’ your core (rotationally) as powerfully as you can. Repeat this two-stage process indefinitely to increase the distance of your throws. Push your limits in every way you can think of – for every limit you can think of, there is an overcompensation limit you can also push, and it will all help you be a well-rounded and versatile thrower & catcher. I’ve listed some below (print & take to your throw-around), however this is by no means an exhaustive list and I recommend you come up with your own! Comfortable, warming up throws but still focused – ie. proper pivots, moving body to make catches, making EFFORT. No sloppy throwing. No sloppy catching either: use the correct hand, clap catching or two-handed crab when you can. Your completion rate should drop in this section – it’s about pushing yourself past your limits. Throws are meant to feel awkward. View this as good catching practice as well! Jump ball – standing slightly less than your hucking distance apart, throw long, high discs to each other. Throw roll-curve and IO, practice attacking these and catching at the peak of your jump, or on your way down. It’s better to have a few go over your head before you catch one correctly, than to constantly catch them safely. Read the disc early, plan your approach, jump to your max. Fake on opposite side before each throw. Make sure your fakes are believable – sharp snap of the wrist on fake, wide pivot and low as possible for both, try to remain balanced. Stretch to warm down afterwards. If you’re pushed for time, chop out one of the sections, but make sure you don’t always chop the same one. Optional extras: pulling practice, hucking practice. If you want to huck or pull in games you will need to practice it between trainings. For these bigger throws, make sure you warm up your arms a little more beforehand.